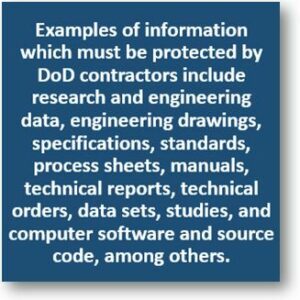 eeting DoD Cybersecurity Requirements Just Got Easier! 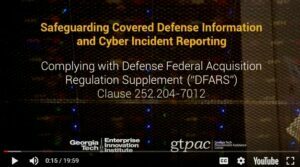 The Georgia Tech Procurement Assistance Center (GTPAC) recently unveiled invaluable new resources for businesses seeking to comply with the Department of Defense (DoD) cybersecurity requirements. They have produced a 20-minute instructional video which takes contractors step-by-step through the requirements and created a 127-page template that can be used to develop a Security Assessment Report, a System Security Plan, and a Plan of Action – documents called for under the requirements. The video and template were funded through a cooperative agreement with the Defense Logistics Agency and created with the support of the Georgia Institute of Technology. (The content of the video presentation does not necessarily reflect the official views of or imply endorsement by the U.S. Department of Defense, the Defense Logistics Agency, or Georgia Tech.) GTPAC is a part of the Enterprise Innovation Institute (EI2), Georgia Tech’s business outreach organization which serves as the primary vehicle to achieve Georgia Tech’s goal of expanded local, regional, and global outreach. EI2 is the nation’s largest and most comprehensive university-based program of business and industry assistance, technology commercialization, and economic development. For further assistance with complying with DoD’s contractual cybersecurity requirements, please contact your nearest Procurement Technical Assistance Center (PTAC). In addition to expertise and resources regarding cybersecurity requirements, PTAC professionals can provide in-depth guidance on the full range of government contracting issues, all at little or no cost to you. Located in all 50 states, the District of Columbia, Guam, and Puerto Rico (and coming soon to the Virgin Islands), they can help you chart the right course for your business. Click here to Find your PTAC now.